Moscow State University’s Faculty of Political Science and the Jawaharlal Nehru University’s School of International Studies will soon begin academic exchanges within the framework of the cooperation agreement signed in October 2014, among the first between the leading Russian and Indian universities. The Political Science Faculty of Moscow State University (MSU) and the School of International Studies (SIS), Jawaharlal Nehru University (JNU), are set to begin academic exchanges within the framework of the cooperation agreement signed in October 2014. The program will be one of the first of its kind between the leading universities of Russia and India. “We want to offer the Russian students a chance to expand their scientific knowledge about India, which in Russia is traditionally limited to the university studies of ancient Indian philosophy of classical treatises, in particular, the ‘Upanishads’,” Nikita Setov, Deputy Dean for Academic Affairs, Faculty of Political Science, MSU told RIR. He is currently in New Delhi to write a monograph on the history of Indian political thought from ancient times to the present era. In turn, Sanjay Pandey, Chairperson, Centre for Russian and Central Asian Studies, SIS, JNU will arrive in Moscow next week. He will deliver a series of lectures on Russia-India relations to the MSU students. The professor is also due to visit Kaliningrad, where he will participate in a scientific and public forum of the Russian Society of Political Scientists on the ‘70-th Anniversary of the Great Victory: Historical Lessons of the Past and Political Challenges of the Present’. “With regard to student exchanges, we expect to provide annual trips to up to 10 Indian under graduate and graduate students,” Setov said. The first four post-graduate students from JNU should arrive in Russia in May, for six weeks. According to Setov, the students will be able to attend lectures, as well as to gather material for their papers. “We as teachers will be ready to provide them with advisory support in the process of writing papers,” he said. The Agreement between the MSU and the JNU also provides for joint research in the areas of mutual interest, exchange of publications and organizing conferences. “This way, Russian students get the opportunity to present their findings in the English-language scientific journals,” he said. 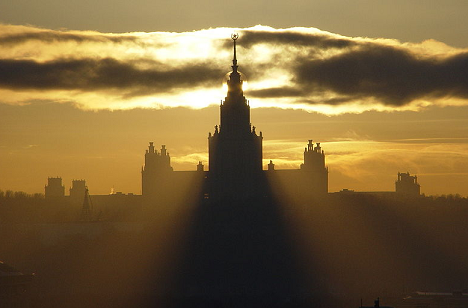 Moscow State University may become another Russian "Silicon Valley"
MSU is also interested in developing cooperation with regional universities of India, Setov said. The MAKAIAS round table was held on April 6, which was attended by Sitaram Sharma, Chairman, Executive Council, MAKAIAS and Irina Bashkirova, Consul-General of the Russian Federation in Kolkata. “Academic exchanges are certainly important. They are an integral part of bilateral relations between India and Russia,” Bashkirova said. The diplomat said that the possibility of signing a memorandum of understanding between the number of Russian universities and the University of Calcutta is being worked out currently. Setov and Sharma, in turn, agreed on scientific cooperation between the MAKAIAS and the MSU. One of its directions will be holding webinars. “In today's political situation it is extremely important to study the relations between Russia and the leading Asian countries, one of the most important of which is India,” Setov explained. Summarizing his first visit to New Delhi Andrey Shutov, Dean of the Faculty of Political Science of Lomonosov Moscow State University said in an interview to RIR that Russians have always shown much interest in India – its rich culture, traditions, and customs. “Many generations of our citizens have studied this country from the point of view of social and humanitarian knowledge. Cutting these relations with the collapse of the USSR was not our choice, but the one made by the elite which came to power in the early 1990s. And there has always been a yearning for those ties once severed as well as the wish to restore them, among many generations of professors and among students”, Shutov said. The Dean is also convinced that today’s students in Russia are “definitely waking up to India”. They are also interested in the West, of course. But India has its special charm; the aspiration to study it is evolving”, he insisted.